Promotional screwdrivers with a customized message are a useful advertising tool that everyone appreciates. Promote your name or business with personalized advertising printed on one of our many screwdriver tools. Give us a call at: 706-374-0710 - for a Free quote and assistance in selecting the best screwdriver or other customized tool for your promotional needs. 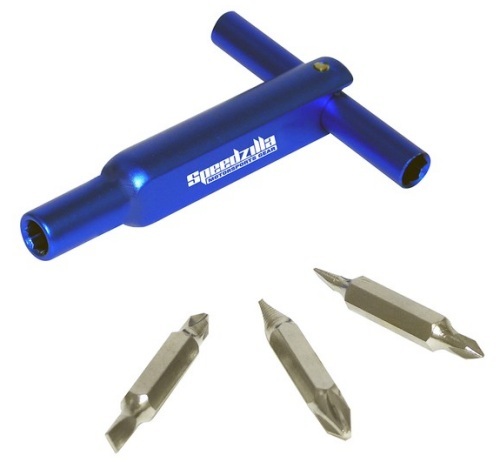 Handle folds out to make a "T" for extra leverage.Includes three double ended screwdriver tips with regular or Phillips screwdriver heads. The screwdriver head sizes are #0, #1 and #2. Available in royal blue. 6 in 1 Multi Use Screwdriver is 5/8" wide x 5-1/2" long x 7/16" high. Imprint area on handle is 1-5/8" wide x 1/4" high. Laser engraved, shows as white. We also offer many more custom promotional tools. On June 25, 1962, the Supreme Court stopped school prayer. "From the early days of the American colonies, prayer in schools was practiced and revered as an important tradition. Indeed, for nearly 2 centuries of our history it was considered a natural expression of our religious freedom. Then in 1962, the Supreme Court declared school prayer illegal." "Well, I firmly believe the loving God who has blessed our land and made us a good caring people should never have been expelled from America's classrooms." 'Can the liberties of a nation be secure when we have removed a conviction that these liberties are the gift of God? Indeed I tremble for my country when I reflect that God is just, that his justice cannot sleep forever.'" "Jefferson's words are a forceful and explicit warning that to remove God from this country will destroy it."